Minister Malkinson (L) introduces Alberta’s first consumer bill of rights with Scott Stolee and Jeff Loomis. 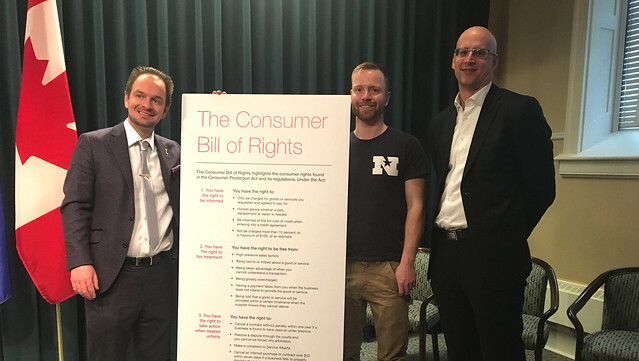 The one-of-a-kind Consumer Bill of Rights follows four years of work to strengthen consumer protection rules in Alberta. The simple two-page document is the first of its kind in Canada. It summarizes the main protections in the Consumer Protection Act into an easy-to-digest format that will help people understand their rights, be protected from potential financial losses and know where to turn if they’re treated unfairly. The Consumer Bill of Rights can be viewed online, and businesses are encouraged to print the document and share it with consumers. Banning the use of ticket-buying bots and improved consumer access to refunds from resellers. Introducing industry-wide standards for vehicle sales and repairs to improve accountability in the sector and better protect consumers from unexpected or unauthorized charges. Introducing a licensing framework for high-cost lenders to ensure responsible operations and help consumers better understand the nature of high-cost credit products. Payday lending: Put an end to 600 per cent interest rates on payday loans to help prevent people from becoming trapped in a cycle of debt. Today, payday loan borrowers pay lower fees, have more time to pay off their loans and are paying them off in smaller installments. Door-to-door sales: Put an end to misleading, aggressive sales tactics by banning door-to-door sale of energy products and services. The ban includes furnaces, hot water tanks, air conditioners, windows, energy audits, and electricity and natural gas contracts. Electricity price cap: Introduced a price cap to make life more affordable and ensure electricity bills are fair and reasonable. New home buyer protection: Introduced a builder licensing framework to protect consumers as well as the reputation of good builders. Condominium living: Introduced condo regulations to improve buying and living in a condo. Utilities Consumer Advocate: Expanded the advocate’s free mediation services to water bills and improved the advocate’s ability to report on the performance of gas and electricity companies to help consumers make well-informed choices. Twelve statutes and 46 regulations make up Alberta’s consumer protection laws. The Consumer Protection Act is the primary legislation that ensures transactions between businesses and consumers are conducted fairly. Service Alberta’s Consumer Investigations Unit investigates potential violations of consumer protection laws, reviews complaints about transactions between businesses and consumers, and recommends enforcement action where legislative breaches have occurred. Service Alberta’s Consumer Investigations Unit concluded more than 800 cases during the last fiscal year. As a result of these investigations, the courts ordered roughly $960,000 in restitution be paid back to consumers, and levied $340,000 in fines to individuals and businesses for contraventions such as misleading consumers, operating without licences or failing to refund consumers. In addition to court-ordered penalties, Service Alberta undertook a number of administrative actions, including issuing nearly $40,000 in fines and ordering multiple businesses to comply with laws and regulations.